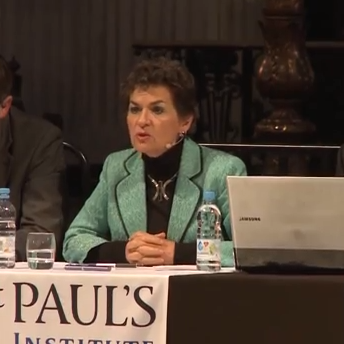 Christiana Figueres of the UNFCCC shares her views on the key challenges faced and highlight what faith communities, the City and the UK at large can do to help. As well as questions from the audience, a panel of distinguished speakers identify the impact of climate change on their sector to help build the will for political action. The discussion was Chaired by Bishop James Jones, former Bishop of Liverpool and BBC Radio 4 presenter. Panel of speakers: Rear Admiral Neil Morisetti (former UK Government Climate and Energy Security Envoy), Dr Tony Juniper (Author and Environmentalist) and Peter Pereira Gray (Managing Director, Wellcome Trust Investments).